*While I'm in Europe - I'm on a cruise right now - we're docked in Barcelona today! - I've lined up some fabulous guest posters. Please welcome Danielle from The Inky Melody! In a world governed by those who listen to the earthlines, Mirasol is only a beekeeper with the same talent. But soon, the Circle come to her, telling her that the previous Master and Chalice are dead and have no heirs, and she must take over as Chalice with a Master fresh from the Priests of Fire. This now untrained beekeeper Chalice must bind the land with a new Master who is not fully human anymore. This world takes place in the Demense, as it's referred to, with little mention of the surrounding neighbors. But I love the scenic beauty, and the clear, descriptive world with its politics and common lives intertwined. Ani is a princess who can speak to animals, but her people are suspicious of the talent. Her mother the Queen is forced to send her off to an arranged marriage in a neighboring kingdom. On the way there, though, her lady in waiting and the guards attack her, and she is forced to flee and hide her identity as a goose girl in the country of her was-to-be husband. There, she makes friends and meets a man, but everything could be in jeopardy as this kingdom and her birth kingdom totter on the brink of war. Both of these kingdoms have seperate, wonderful identities. Ani is a part of both, and you feel her tearing in half as she tries to decide her loyalties. In this case, the setting is almost as much a character as she is. 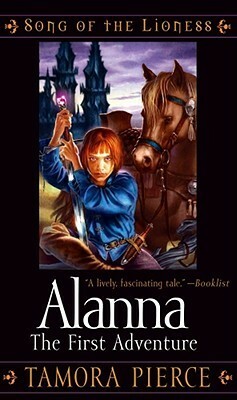 Alanna and Thom are twins, but as a girl, she is forbidden to be a knight. Thom, as a boy, wants to be a sorceror and doesn't want to be a knight. When their father sends Thom off to be a page and Alanna for the convent, they switch places, and suddenly Alanna gets to train to be a knight. But it's not easy learning, and soon she must master herself and her magic as an adventure to an ancient place goes horribly wrong. Tamora Pierce is a master at fantasy worlds. This realm, Tortall, is beautiful and clear. It's been awhile since I read it, but I can still remember the nightmarish place where things go wrong (to say more would spoil it), as well as certain parts of the castle where she's training. I highly recommend these three books. All three are amazing worlds - medieval and magical, you could say, but still as real as our own. Words cannot express how much I love The Goose Girl! The audiobook is especially wonderful! Hmm, I have not read any of these but I have heard of the Goose Girl. I heard that book is good. I need to read Chalice, because The Goose Girl and Tamora Pierce are both AMAZING. 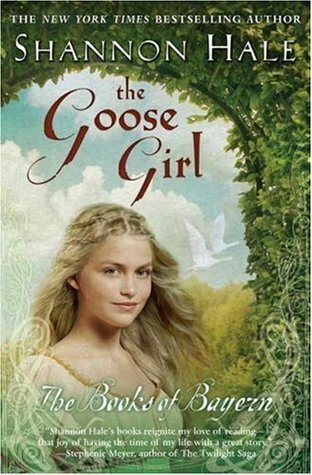 The Goose Girl is one of my very favorite books of all time.